Choosing to die with dignity when your body is falling apart is a hotly debated topic. But what happens when one's entire family agrees with that decision, only to see the person in question live on for longer than expected? Such is the basic premise in Lily Thorne's playwriting debut, Peace for Mary Frances, now being presented by The New Group. An interesting idea to be sure. Unfortunately Thorne loads up the story with so many characters and sub-plots, the show sinks under its own weight long before the final curtain. 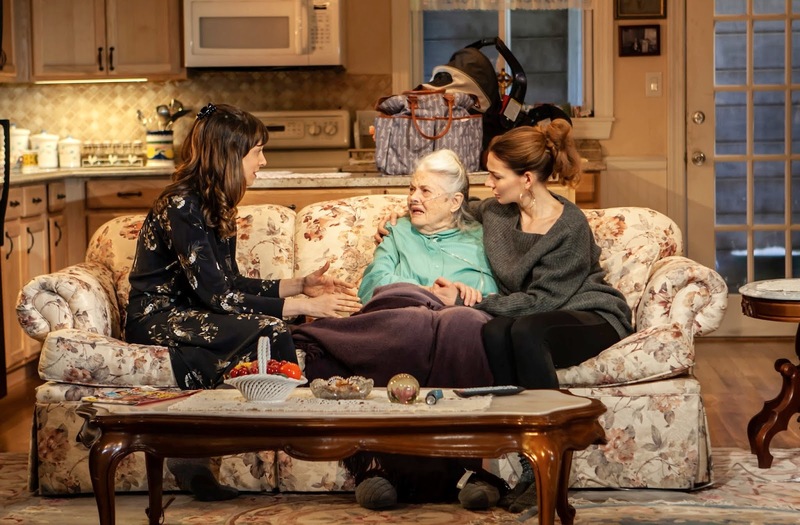 Mary Frances (Lois Smith), having reached the age of 90, has gotten to the point where she feels she can no longer enjoy life. She needing she assistance to go to the bathroom, get into bed and simply get off the couch. She is also taking numerous medications that need to be administered on a strict schedule. However, Fanny (Johanna Day), the youngest of Mary Frances' three children, and her companion during the daylight hours, is not all there mentally, and thus unable to ensure proper steps are followed in this regard. Fanny is also a recovering drug addict and not allowed to spend the night at the family home due to an earlier incident with a lit cigarette. As a result, Mary Frances' other daughter Alice (J. Smith-Cameron), must become her primary caregiver, even as she makes plans to die in her own bed. Alice and Fanny, as quickly made clear, have a long-standing adversarial relationship; neither trusting the other. At least part of the problem stemming from the period when Fanny was a regular drug user. Yet Alice is no angel either. She having in the past gone through a long period of not speaking to her mother. The animosity between mother and daughter so strong that, for a time, Alice was cut out of Mary Frances' will. Alice also has two daughters of her own. Helen (Heather Burns), an actress; and Rosie (Natalie Gold), who is happily married with children. Helen noting that Rosie's kids will be the first members of this family to be raised by parents who really love each other. A not-so-veiled reference to various familial situations that have occurred over the years. L-R: Natalie Gold, Lois Smith, Heather Burns in Lily Thorne's "Peace for Mary Frances," directed by Lila Neugebauer. This world premiere Off-Broadway production from The New Group plays at The Pershing Square Signature Center. www.thenewgroup.org. Photo Credit: Monique Carboni. Thorne brings up a lot of interesting issues in her work, which also marks her professional debut as a playwright. Included among them are the right to die, the different levels of sibling rivalry, and children trying to live their own lives while continually vying for a mother's love. All these issues would be ratings fodder for any number of self-help shows. However for something like this to work on stage, the author needs to know where they're going with the story, and what they're specifically trying to say. Something which is sadly not the case here. The various characters are only half-developed, while the audience experiences numerous plot lines which are often left hanging. Such as Helen suddenly attacking Fanny during a verbal altercation - the matter just as suddenly dropped. We also never really get an idea of who Alice is or what caused her prior estrangement from her mother. As for Fanny, she disappears for much of the last third of the show, appearing only twice thereafter. The first scene of which makes no sense, given what we know of the character up to that point. There are also questions about Mary Frances herself. Not only may she be healthier than she lets on, but she also shows herself to be a rather manipulative woman. She continually playing each of her daughters off the other. The biggest irony of the show is its title. Mary Frances supposedly just wanting to die in peace, but she is often the one continually stirring up drama and keeping everybody on edge. It also doesn't help that the show has numerous characters one doesn't really care about. Such as Eddie (Paul Lazar), brother to Fanny and Alice, and the family lawyer, who comes by to visit once a week and go over his mother's affairs. Though why he's so detached from everything, except at the very end, is another question that's never answered. Also, the idea of the family calling an assisted care facility right out of the phone book, without doing any research on them, also doesn't ring true. Both the acting and directing are more than adequate here. Smith, Day and Smith-Cameron all doing excellent jobs in their not-always-sympathetic roles. Most of the supporting cast also doing the best they can with what they have to work with. Brian Miskell, playing a hospice psychologist, injects a brief bit of levity into the story when he assures Alice and her daughters that this isn't the worst family situation he's ever had to deal with. A remark which provoked more than a little knowing laughter from the audience. Lila Neugebauer's direction moves the story along nicely as she works to bring some extra life to the various moments of tension and confrontation. A hospice nurse (Mia Katigbak) tells Mary Frances at one point how some people refuse to die when they still have unfinished business. Applying that axiom the play itself, Peace For Mary Frances could do with some serious reworking before appearing in its next stage incarnation. Featuring Heather Burns (Helen), Johanna Day (Fanny), Natalie Gold (Rosie), Mia Katigbak (Bonnie), Paul Lazar (Eddie), Brian Miskell (Michael), Melle Powers (Clara), Lois Smith (Mary Frances), J. Smith-Cameron (Alice). 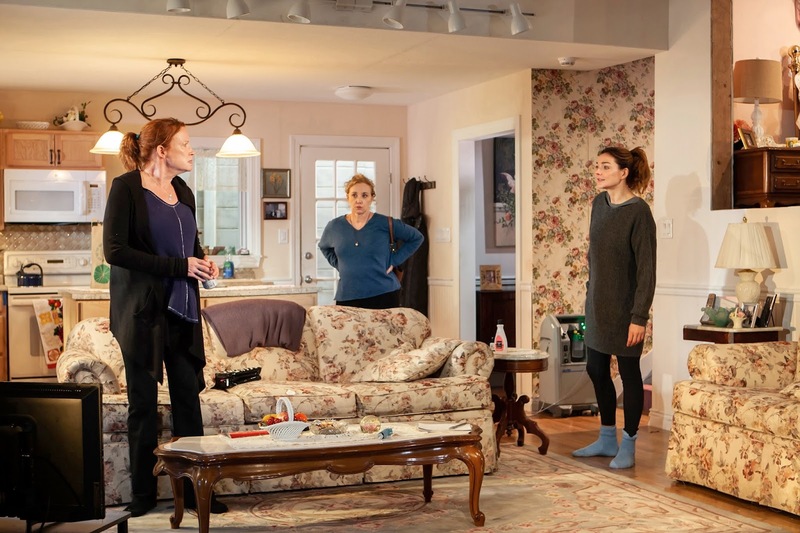 L-R: Johanna Day, J. Smith-Cameron, Heather Burns in Lily Thorne’s “Peace for Mary Frances,” directed by Lila Neugebauer. This world premiere Off-Broadway production from The New Group plays at The Pershing Square Signature Center. www.thenewgroup.org. Photo credit: Monique Carboni.